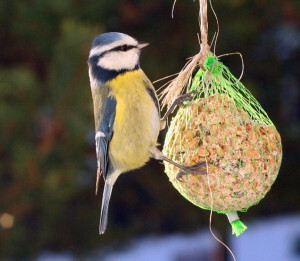 The fat balls hanging from the bird feeder in my garden are never ending source of amusement and fascination. On this beautiful Saturday morning as I write, sitting here in the garden, the to-ings and fro-ings of these well-loved little birds inspired me to think about how all life has a natural hierarchy. A pecking order, perhaps, to the onlooker, but as I sit quietly and observe more intently I can see that this natural order of things works well. The noisy young Starlings beautiful and be-speckled, frighten off the smaller birds with their squawking and clicking, as they vie for position at the top of the feeder. They peck eagerly and almost furiously with their long sharp beaks piercing through the fat to the seeds, spilling crumbling food to the ground in chunks. A mother Thrush, one of our favourite song birds, quietly picks up the food in her beak and hops over to two hungry babies waiting with mouths open sitting among my flower pots. Even smaller crumbs are gathered by the little Sparrows. As I sit quietly and watch I can see one of them feeding her baby fledgling who is hiding in the shady branches of our fig tree. In Mother Nature’s kitchen, nothing is wasted. How do these comings and goings of the common garden bird inspire spiritual learning? Because in life too, if we are aware and reflective, nothing is wasted. Like everyone else I have my emotional ups and downs. I can be hurt by careless actions. (I’m probably also guilty of unintentionally hurting other people too). But there are ways of shifting the energy, changing what seems like an untenable situation into a positive outcome. A couple of week’s ago I wrote about the amazing, powerful transformational energy of Zadkiel and the Violet Flame. But all the angels and Archangels, as well as the Ascended Masters, are always there, waiting in the wings to fly in and assist. They are not ‘somewhere else’, sitting in some heavenly waiting room waiting to be called – they are right here, right now, energetically enmeshed in our universe. Cosmic energies that we can tap right into with our minds and hearts. Everything we do has a karmic effect, so when we are struggling, there is a message within the situation of cause and effect for us to learn from. Are we experiencing the outcome of previous dealings with another in some way? Pay attention to the details of how you are feeling in every experience as whatever direction you take, either sends or brings energy of the same kind. There are signs that become so obvious we can no longer deny their existence. The lesson is there. Perhaps we are being shown that it is time to change our own way of thinking, or maybe to let go of someone whose toxic behaviour is damaging. In most areas of our lives a ‘hiccup’ within a relationship is simply a call to be more loving in some way. Even if it is to stand up for what we believe to be right in a gentler manner. 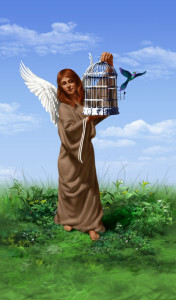 Archangel Michael energy is available to cut ties with those who hurt us. He’s the warrior, the ‘Big guy’ who swoops in with his armour and sword. But unlike the brutes he is there to protect us from his power and strength is always fair and just. Even if to those who don’t understand the hidden workings of the Heavenly realms, some situations are hard to comprehend and may seem like pretty harsh tactics. Archangel Uriel, equally warrior-like, and controlling power behind millions of hosts of angels, comes along in the middle of a messy situation and asks us to ground our energies and connect with an inner peace. He the oil upon troubled water. Archangel Raphael is the one to call in order to heal, as you know, but by surrounding yourself and any difficult situation in his bright green light you can also heal a rift or a difficult breakdown in a relationship as well. There will always be ‘bullies’. Those people who push others around, caring nothing about trampling on hurt feelings, reckless in their pursuit of self-gratification. There will always be people known as ’emotional vampires’ who zone in and drain our energy – whether intentionally or otherwise. But my point here is that in every situation is an opportunity for positive outcomes; for spiritual growth and understanding. There is always a hidden benefit, and there is always, always something to be gained and something to be grateful for.